Specifically designed to test modular-terminated (RJ45, RJ11, RJ12) for wire continuity and mis-wiring. Can be used to test a variety of pin configurations such as USOC 4, USOC 6 and USOC 8, whether the pins are crossed or wired straight through. 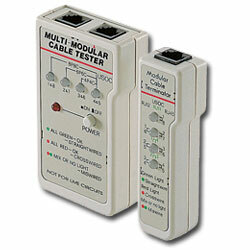 Perform all of the above tests on installed cables with the remote terminator.